For three years by now Byezhitsa church has ministered to the deaf people in Bryansk. 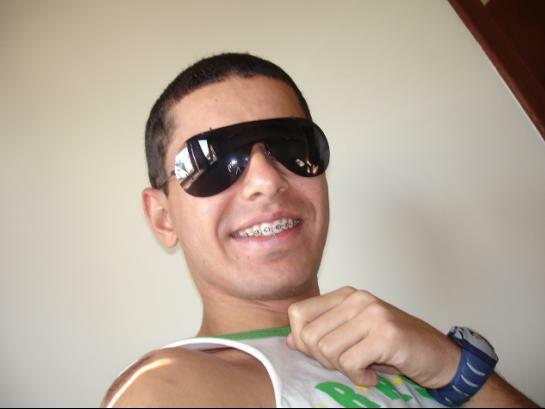 And now looking back we understand that “hitherto has the Lord helped us”. No doubt, God also desires the deaf people equally with those who can hear well to take the Great Commission into every village and city and nation. One thousand deaf people live in Bryansk. Some of them have already accepted Christ as their Savior despite many hindrances in the face of their relatives, neighbors, and co-workers. True indeed that His “strength is made perfect in weakness”. We started evangelizing the deaf in the spring of 1998. Until then there had only been 1 deaf person attending the church. In June 1998 we held a first Christian camp for 3 deaf children, which made it possible to start later Sunday school for the deaf. 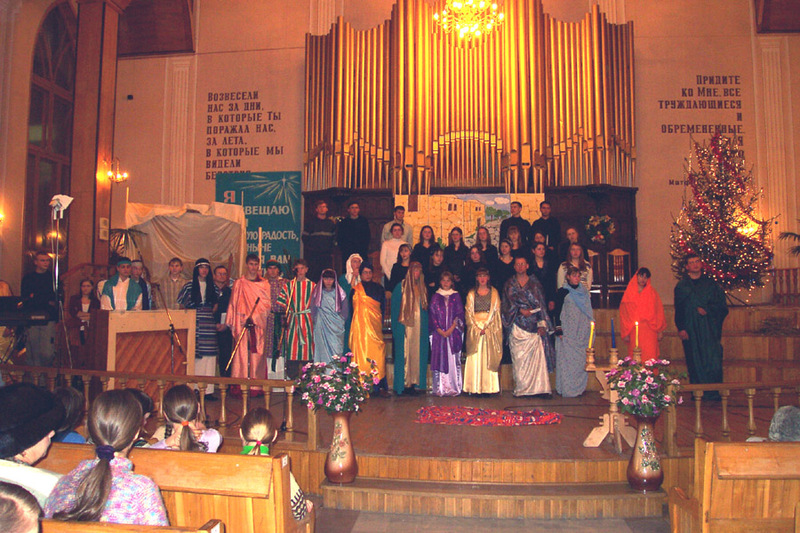 In October 1998 we had a special evangelistic service for the deaf people of Bryansk. About three hundred non-hearing people came to our church. God was really at work on that day and He showed “great and mighty things” by adding 32 converts. Most of them started to attend the church regularly and study the Bible. The people who helped them a lot were Alexey Volodin, our only deaf Christian, his wife Olga who is a hearing person. Later God has given us two more sign interpreters, one of them is Christian. Aleksey was baptized in 1992 and for a long time was the only deaf person going to our church. He constantly prayed for the revival among the deaf in Bryansk. In March 1999 God provided His deaf children with ministry opportunities and on March 14 our deaf team went to the city of Klintsy to share their faith with the deaf people there. As a result we had 3 conversions. We have been praying for the Holy Spirit to move in this town and bring repentance and revival. 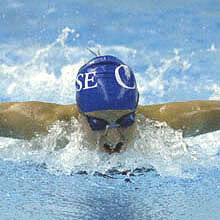 In June 1999 3 deaf people were baptized and become members of the church. In August 1999 we held a second Christian camp. This time 58 deaf children heard the Good News. Ten of them began attending Sunday school classes. In the year 2000 our deaf brother Aleksey Volodin went to St. Petersburg to enter the International Bible School for the deaf. 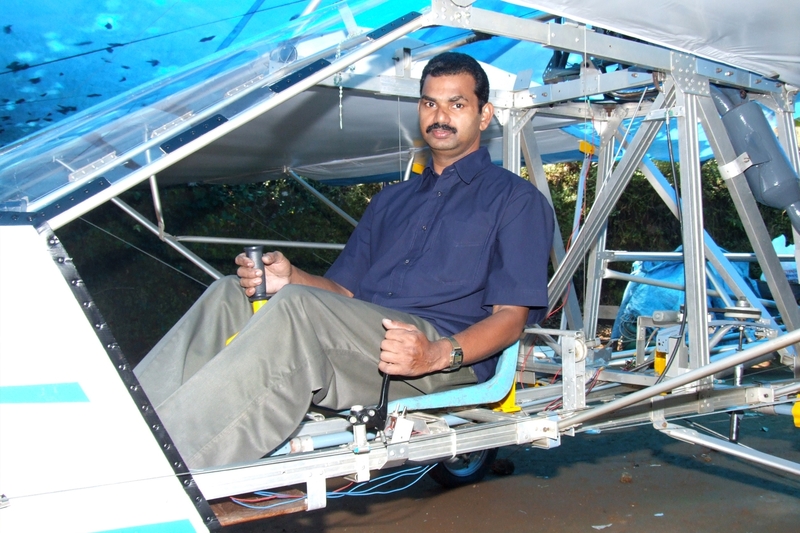 For three years now he has been a small group leader and a Sunday school teacher. In March 2001 he was ordained as a deacon to serve to the deaf. And we praise the Lord for expanding Aleksey’s ministry. 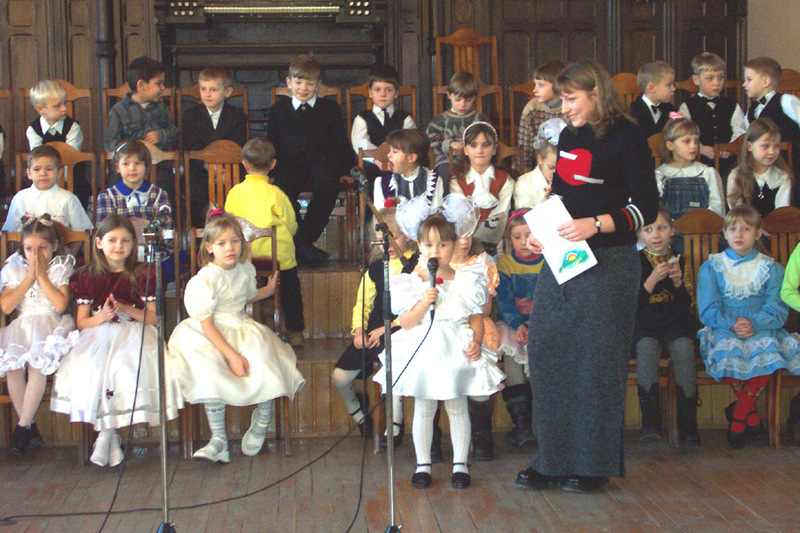 In January 2000 we gave Christmas performances called “Christmas 2000 - to our children”. More than 200 deaf children from Bryansk nursery school no.127 and specialized school no.68 enjoyed these performances and got Christmas gifts. Many of them now attend Bible classes and go to Christian summer camps. In August we again for the third time held a Christian camp for 13 deaf children in the town of Seltso located n a picturesque place not far from Bryansk. We also had an evangelistic outreach for grown up deaf people in the local church. In October of 2000 God blessed us with the first wedding between two young deaf people,. our small group members. They gave invitations to many unbelievers to attend their wedding party, and thus testified them about Jesus’ love. In December we started a new ministry for the old deafs called “50+”. Only few old deaf people can understand the sign language of the Bible. That is why we think it important that we will do our best witnessing to them for Christ. Now one of the old ladies is preparing to be baptized. On December 25, 2000 we made Gospel presentations for deaf children. All of them received gifts from the international organization “Samaritan’s purse”. In March 2001 we showed the deaf people the Jesus film. We also had many deaf children and their teachers from school no.68 for this film. We are on friendly terms with this school and we believe that God desires us to minister to these children. They have a lot of needs in the school: there is no dining room, the necessary equipment, and the children need hearing aids. Our church has partly helped the school in buying a new bus, which takes the children who live a long way from school home. 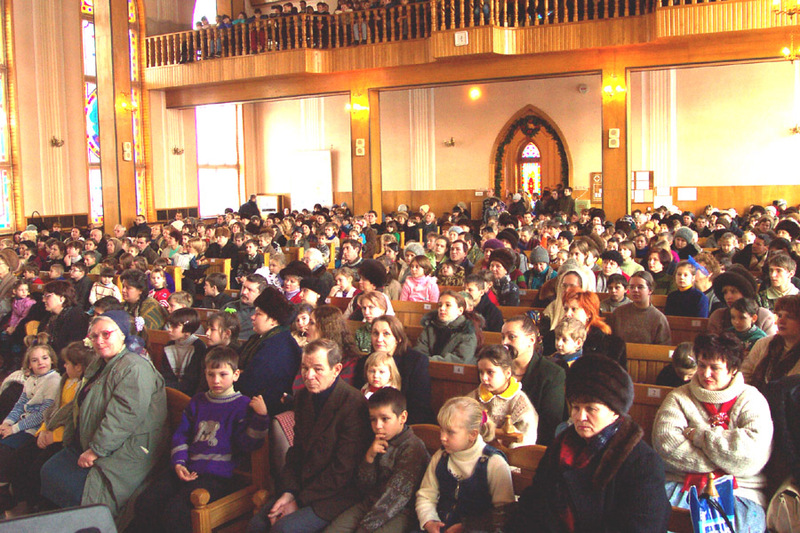 On March 31 and April 1, 2001 we had another evangelistic outreach for the deaf in Bryansk. The deaf group members had fasted and prayed three Fridays and God brought more than 330 deaf people to our church. Many of them were challenged about their walk with God. In December last year we started a small group ministry in one of the four districts of Bryansk – Novi Gorodok, in which there live 297 deaf people. We continually pray that God will enlarge this ministry. Many deaf married couples have problems in their family life. That is why we have recently begun special meetings in our local church on Tuesdays, to spend time talking through biblical principles for a happy marriage, of which many people have not heard before. 4 couples attend these classes and we ask God to bless our family ministry. Today about 30 deaf people go to church, 10 of them are already members of the church. After the morning worship service the deaf gather for a Sunday school class given by our deaf brother Aleksey. It is desirable that our deaf people may enter a Bible school. We pray that there will be a special training program for the deaf in Bryansk Bible Institute. We believe we will have our church for the deaf, which will send deaf missionaries out into His service to the areas in Bryansk province and other cities of Russia. We pray that our Lord will strengthen and support us in this battle for men’s souls so that the deaf may belong to our Creator, worship Jesus Christ and grow in holiness. We also pray for all those who share in our deaf ministry. His children all over the world feel close and united into one big family, and that has become possible through the love of our Heavenly Father. He works in a wonderful way, guiding and protecting us, teaching and providing for the needs, to help us do His work, for His glory and our joy. I would like to share the joy and blessings He has given us in the work of which you have become participants, and you also share these blessings. You have been with us during the Christmas events in our area in the city of Bryansk, with your prayers, your thoughts, your wishing us well in everything we do, with your love and caring, remembering your brothers and sisters in Byezhitsa. We thank you so much for your involvement!!! Here is an update of the Christmas events in Byezhitsa Church. Christmas is the biggest holiday of the year when the hearts of the believers all round the world are overfilled with joy about Christ’s birth, when we praise the Lord, sing glory to Him, and witness about His great love to people, to touch as many hearts as possible. The youth of Byezhitsa church together with their leaders and the teachers and children of the Sunday School prepared several Christmas programs for the children, youth and adults to reach out to many non-believers of the city. We printed and distributed 2400 invitation cards for the children from the poor, broken, or incomplete families, for the children from orphanages and invalids. All the children who came with the invitation cards received Christmas gifts. We advertised our programs and concerts on the local TV and radio stations, in the newspapers, on posters, to allow as many people as possible to know about Christmas events in the church Church. On December 23, 24, 25 we had three concerts that were held by the church string orchestra, the Christian youth group “Bridge” and the church choir. Music has great power that can touch the depths of our hearts and make spiritual things closer and dearer to man. God became closer to many people through the music that was played and sung on those nights, through His Word that they heard, and 10 people out of those 400 present accepted Jesus as their personal Savior. The money we gathered at those concerts went to get Christmas gifts for the children. On December 29 the church held the Youth Musical Festival, the event that brought to Bryansk the Christians from Ukraine, the city of Seltso, Bryansk regio n and other places. There were many non-believing young people present. The audience could enjoy the beautiful choir and soloists’ singing that night. The young musicians witnessed about Jesus to hundreds of people fascinated by their singing and acting. The program started with the song “Candles”. To create the atmosphere of friendship and warmth in the sanctuary full of young people, the participants turned the lights off and got many candles burning that helped those who came to the church for the first to feel more at home. The audience were active participants of the evening singing glory to God together with the choir, as the words of the hymns were projected on a large screen. On January 2, 3, and 4 the church held Christmas programs for the children. Those meetings gave us a wonderful opportunity to build bridges to the hearts of the orphans, invalids, kids from broken families who are longing for love and care more than anybody else. The first day was a kind of shock to us as we did not expect so many children to come. There were many kids who did not get an invitation card but on hearing about the program from their friends they did not hesitate to come. The young singers, actors and actresses did their best so that the kids were not sorry they spent the time in the church. On January 6 and 7 we continued working with the kids and held two concerts for those interested in music. All the participants were children who praised God for the gift of salvation and joy in Him, and the gifts of playing musical instruments. The youth of the church prepared a very interesting drama that drew the attention of the people of various ages. It was more like a musical, with beautiful scenery and 40 people participating. The church deaf group also had a Christmas program. They invited their friends and relatives, the children and adults, hard-hearing people living in our city, to share the joy of Christ’s birth with them. It was a beautiful evangelism program, with Christmas drama, singing and testimonies, sharing the gospel, and Christmas gifts. During those two weeks of Christmas celebrations over 4000 people attended the church, and 58 of them accepted Jesus and got saved. It is wonderful fruit that God has given us all, and we thank Him and you dear brothers and sisters for your great help and your presense with us in His spirit! We believe that good seeds were planted in the hearts of those who came to the church for those meetings, and the Word they heard will start the flame of love for Jesus in their hearts and this fire will never die out. We bless the Holy name of our God for His mighty work in our area, we praise Him for the fruit He gives, and thank Him for the honor to be His servants in fulfilling His divine will to go and share the Gospel with those who do not know Him, that God’s Kingdom continues to spread in our country, as well as in many other places all over the world. On behalf of all God’s children of Byezhitsa Church, Bryansk, Russia I want to thank our Lord for the blessings we have from Him, and express words of deep appreciation to you all for your prayers and help for our evangelism Christmas program.